A large selection of Parrot Food, Treats, Toys, Accessories & more from our range of Assorted Brands. More assorted products from a wide range of suppliers of Pet Birds & Parrot products. Find more foods, treats, toys, cages, accessories and supplements for your pet parrot or bird right here, from many more top quality manufactures and suppliers. Fast Delivery! Free shipping on orders over £39! Please check back often, as we are always adding new products to this section! Can’t find something you’d like? Feel free to suggest a brand, so that we can try to stock it for you and your pet parrot! 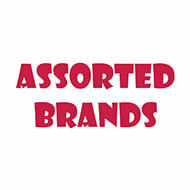 Since our Assorted Brands page is stocked with many choices from assorted suppliers, we are always changing and adding new products to this section. You can rest assured knowing that these products have been thoroughly enjoyed by pet owners and their parrots. Products such as Parrot food and treats, cages, toys and more are included in this section. To make finding something easier, search by category or bird and that will further help you find what you’re looking for! In this section you can find egg based food & treats, manzanita and sanded perches, avian scales, misters and range of parrot supplements, plus much much more.